I used to just paint in oils and still do - but than I got Mark's dvd which helped a lot in what I didn't know. A few acrylic artist friends give me tips too, so I tried the acrylics, and still have a lot to learn. 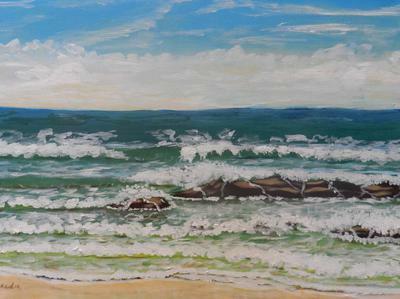 So far I have painted 2 acrylics beach scenes using Mark's ideas. 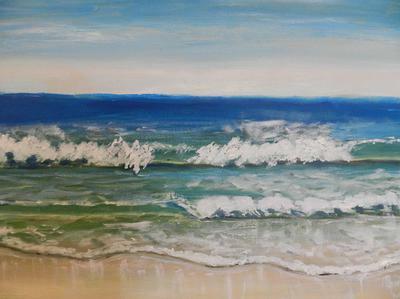 I have painted two seascapes of the beaches not far from me and have had a lot of nice feedback on them. Hey, great work, love the wet sand effect. I think you really captured the mood of the seas which are a bit too dangerous for swimming for my liking. If I was in the scene, I'd be rugged up and not going near the water. Mark's DVDs are terrific. I learn something new every time I watch them. I wanna swim in there! You make me want to go south and walk along those beautiful Illawarra beaches! Thanks so much for sharing your work and your story.